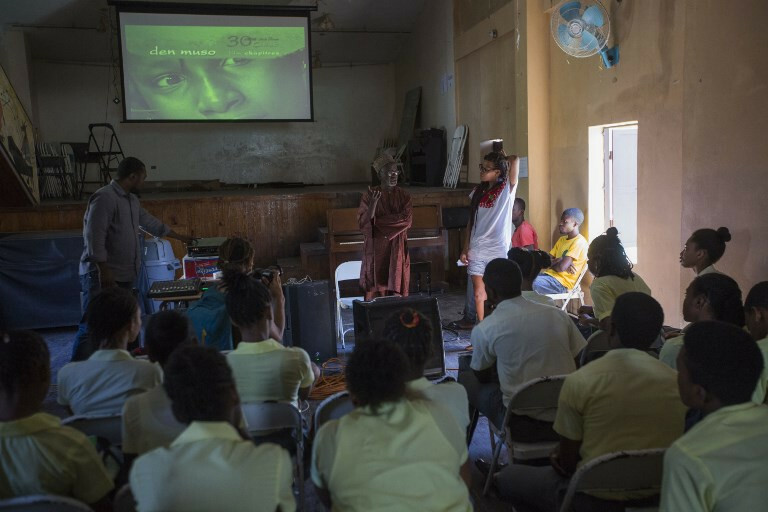 In the Haitian port city of Jacmel, watching a film is something of a labor of love. But with no theaters to speak of in town, it was the best-case scenario -- and better than nothing. "Copies of major Hollywood studio films used to take three months to get here," explains Haitian director Richard Senecal. "By then, television networks had time to pirate the films, broadcast them and even show re-runs. The film was dead on arrival in cinemas." After that, Senecal recounts, "piracy reached the masses: Haitian films were available on DVDs in the streets before their official premieres." Most of the remaining theaters in the impoverished Caribbean country, concentrated in the capital Port-au-Prince, were destroyed. Access to the basics -- clean water and power -- were not guaranteed, and films were an afterthought. In 2015 there was a glimmer of hope when the storied Triomphe theater-cinema, which had closed in 1987, reopened thanks to $7 million in aid from the state. One of those sites was the mega seaside screen in Jacmel, where director Guetty Felin staged the opening events for the "Southern Lights" festival, which this year was dedicated to African film. "The lack of theaters is not the problem: the industry needs to have standards. We don't have a lot of money but why remain mediocre?" said Felin. "That is the challenge we are taking up with the Southern Lights event: screening quality films for people who are thirsty for cinema." "A producer in Miami who wanted a film called me and said, 'Do what you want, I have $5,000, give me something I can put on DVD in three weeks'," Senecal said bitterly. "That's a one-day shoot, and there are people willing to do it. Tasteless films like that flood the DVD market, and kill it for those of us who are more demanding in terms of quality." Malian director Souleymane Cisse, the guest of honor at the festival in Jacmel, said he experienced similar funding dramas in his country, and came to Haiti to plead his case. "In Mali, when we pitched film ideas, embassies told us, 'No, we have other priorities.' But supporting culture helps countries develop," Cisse said. "When culture is cut off at the knees, you effectively keep countries in poverty," added the 78-year-old filmmaker, who screened his movie Yeelen (Brightness), which won the jury prize at the Cannes Film Festival in 1987. "You have to be a bit bonkers to take on a challenge like the one we are facing, but I don't have a choice," said Felin. "The Southern Lights festival is my way of getting involved."